Why Sam Heughan’s Interest in Jamie Fraser’s Cack-Handedness is a Good Thing. While we wait with bated breath for the announcement of who will be cast as Claire, I thought I would share some things to Sam Heughan’s credit that should make you verra excited (as if you weren’t already!). 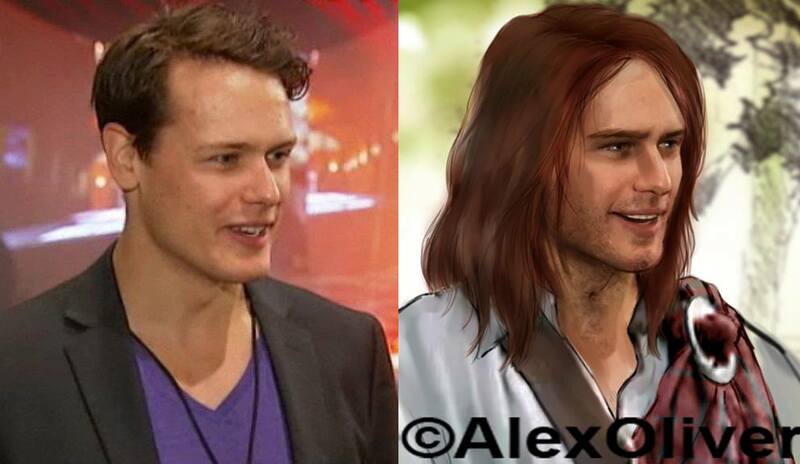 It seems our Sam is truly dedicated to portraying Jamie as accurately as possible. For starters– left-handed-ness was seen (through most of Europe) as a sign that the demons had been at your cradle, and you were likely someone as would bear watching, at the very least. Since they thought red hair was also a sign of the devil (flames, you know), a red-headed lefty was going to be a Suspicious Character. (He’s …got red hair because I have a major weakness for red-headed men. I also had one at home to use as a body model.) That’s why his schoolmasters forced him to write with his right hand, thus doubtless screwing up his central wiring summat, but also giving him a degree of ambidextrousness (which may come in handy if you have to use a sword). Don’t you love having more insight into why Jamie is the way he is? I know I do. How fortunate are we as Outlander fans to know that Sam is taking this role so seriously? I canna tell you how happy it makes me that he is reaching out to Diana and genuinely trying to get inside Jamie’s head. DG’s response to above Tweet.